Well-known actress، Mai Ezz Eldein posted on her official “Twitter” account her latest a photo announcing her new TV series “El Brensisa Bisa”. Mai Ezz Eldein tweeted on the photo “In the name of Allah.. Alaah we ask you success.. El Brensisa Bisa in Ramadan.. Wait me,it is a surprise”. Lebanese superstar، Myriam Fares took to her official account on Twitter congratulating her son, Jayden on his Third birthday. “To my little angel who says"MAMA" 645753765357 times a day.I love you endlessly you are the joy of my life and the best thing that ever happened 2me.Time flies yesterday i held you in my arms you were so tiny today you are turning"3" Happiest birthday"jayden"ya rou7 alba lal mama” She tweeted. Egyptian actress، Yasmin Abdelaziz congratulated Ramez Galal on his new TV film “Sb`a Elboromba” that will be launched in the Cinema in few day. Yasmin Abdelaziz posted in her Instagram story the poster of Sb`a Elboromba and wrote on it “Mabrouk ya Mooza- congratulations”. 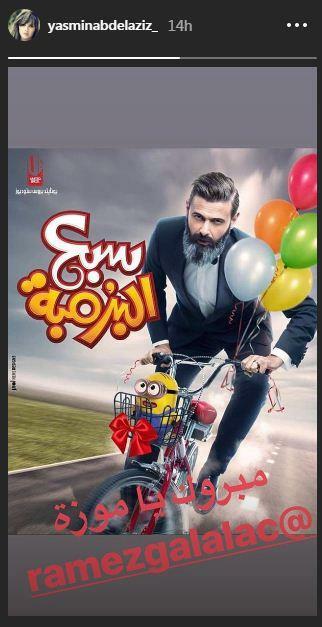 Star Academy`s Egyptian singer, Mohamed Abbas released on his Facebook account the promo of his new single “Rakez Dekika”. Abbas commented on the video saying “A song of a positive energy, entitled Rakez Dekika, wait it soon. Rakez Dekika is by the lyrics of Mohamed El Shennawy and composed by Ahmed Ammar. Egyptian folklore singer, Saad El Soghayar posted new photos of him taking breakfast on the street. “The best breakfast with the best kind people in the world” Saad El Soghayar captioned. Egyptian superstar، Tamer Ashour posted a photo contains a verse from the Holy Quran, announcing that he has got a baby. “Lord bless me with the best girl in the world Ayam, You must share my joy and I wish you all to got this happiness” Tamer Ashour captioned. Japanese club Vissel Kobe`s central midfielder, Andrés Iniesta posted a new photo on his official account on twitter. Iniesta appead on the photo wearing a Vissel Kobe`s red T-Shirt.